Not all stakeholders participating in model coordination use Revit. 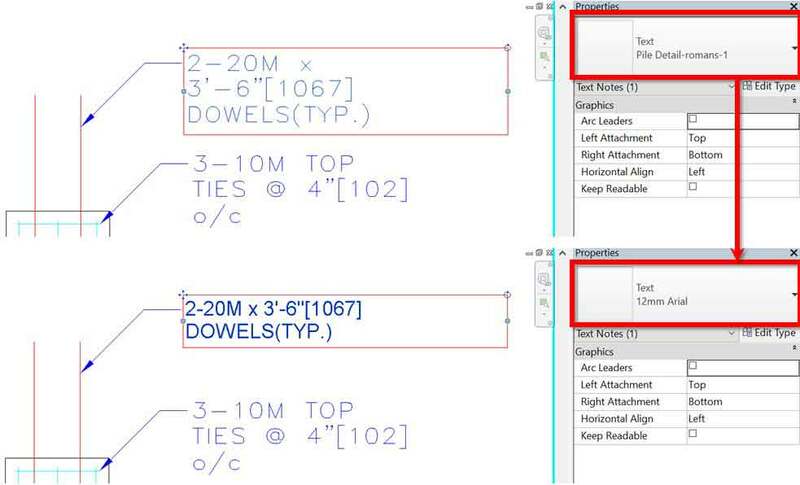 This article will look in-depth at issues you will get from having CAD files such as DWGs in Revit. We will then explore ways to remove them to make your Revit files more lightweight and error-free. Let’s start with defining CAD files. While it’s tempting to think CAD files only come from AutoCad , these can actually be from any computer application in the realm of Computer Aided Design (CAD). These include AutoCAD, Microstation, SketchUp, 3ds Max, and the like. This also explains the wide range of file formats Revit’s Link CAD and Import CAD commands accept., which are DWG, DXF, DGN, SAT, SKP and possibly even more in future Revit versions. Issues with CAD files in Revit stem from the fact that as a Building Information Modelling application, Revit cannot effectively process information created by representative modelling applications like AutoCad. In representative modelling, what showed on screen is just a visual of the design. For example, you may call a thin and very tall box a wall, but this box inherently has no idea what it represents. In Revit however, a wall knows its purpose and therefore holds particular properties to do what it is supposed to, including looking like a thin, tall box. Are managed & purged regularly from the jungle of Revit views & sheets. We’ll see now what will go wrong if these rules are ignored. This rule is mainly for reminding us to keep a linked or imported CAD file as-is, I.e. as a single element. The worst thing you can do is explode it. This is because since DWG lines & hatches are of styles alien to Revit, Revit when exploding the CAD file will will create a whole bunch of new line styles, line patterns and filled region styles in order to turn these into its native elements. These new styles will be named after their layers in CAD, thus blowing up your style list and having you say goodbye to your company’s Revit standards quicker than you can blink. Having said that, there’ll be times where it’s quicker to explode a DWG detail instead of tracing over it manually in Revit. If you really have to, do this in a different Revit file, select exploded elements, and then change each one’s style to one already existed in Revit before the controlled explosion. Once this is done for all elements, you copy & paste them all into a new drafting view in your main project model and use this as your detail view. Linking a live, I.e. still being edited frequently, CAD file into Revit is a recipe for disasters. To be fair, Revit has a mechanism for checking whether something in the model has changed. This is how it can notify you so quickly when you attempt to edit an element someone else in your team still owns because they just modified it but hasn’t synced to central. Expecting Revit to also monitor changes to linked CAD files however, is a tall order, as this data is from a completely different application. Consequently, you could sneakily delete half the elements in a CAD file and Revit wouldn’t complain. It will find this out later on however, when reloading the link, usually upon re-opening the host model or publishing shared coordinates to it. In these scenarios, we can get errors such as “Too many missing elements” or “Model has changed in more than just shared coordinates”, respectively. While the former prevents us from opening the model, the latter will bring a halt to setting up your Revit models properly. 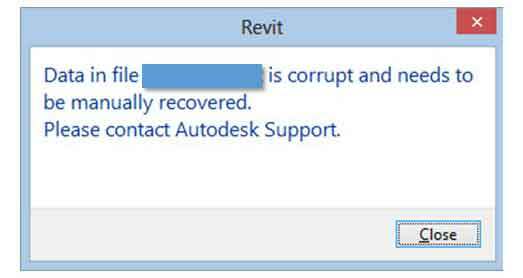 In more severe cases, Revit may crash or the model can become corrupt. This works in tandem with rule number 1 above. Since we link or import CAD files into Revit only for reference, we should remove those we’ve done using. Otherwise, our Revit model’s performance will gradually deteriorate as the number of reference files grows. This will also increase the risk of someone violating rule number 2 above and bring the model to a lockup or corruption. How you choose to manage CAD files in Revit very much depends on how these were linked in or imported. 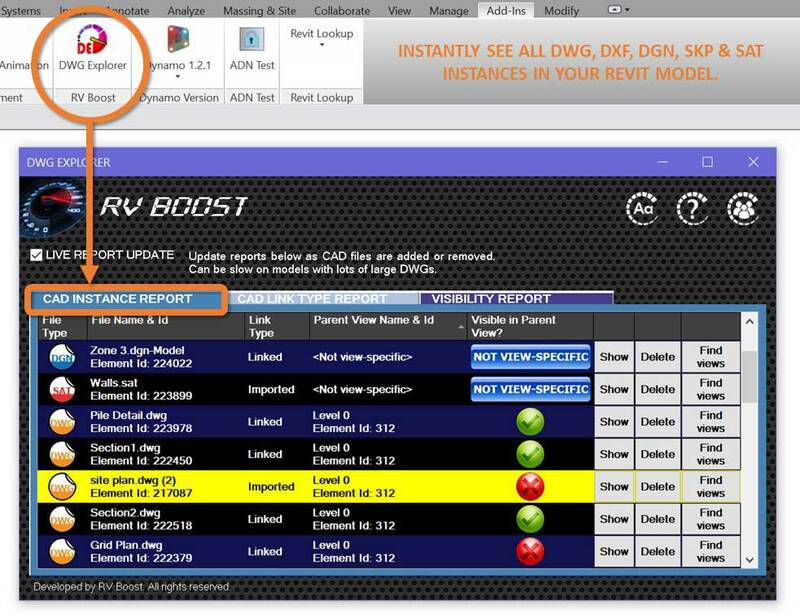 For linked CAD elements, simply use Revit’s Manage Links command to view, select, unload or remove individual files. However, Manage Links lack some crucial functionalities which makes managing these files much more difficult than it should. 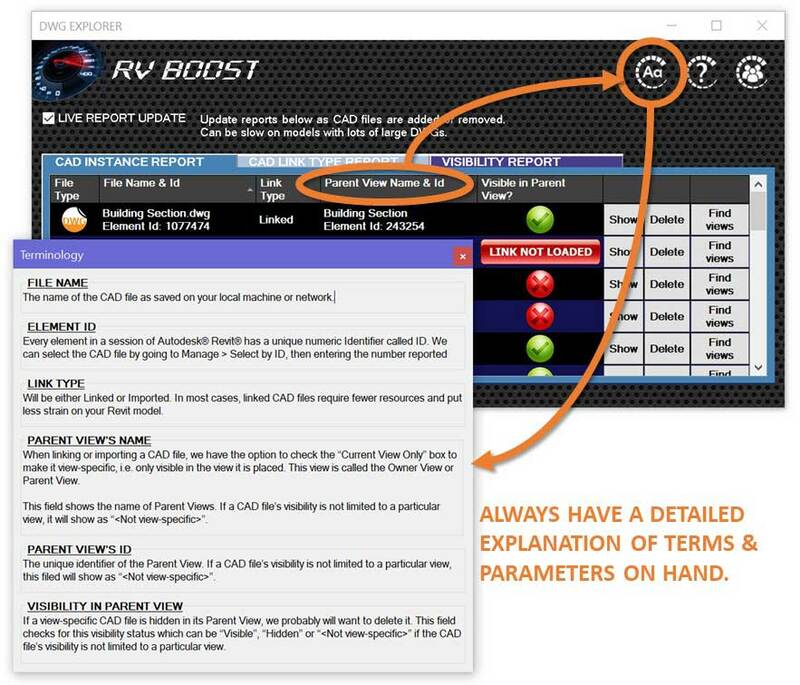 Firstly, Manage Links doesn’t show whether a CAD file is view-specific. This property is set by the “Current View Only” checkbox in the Link CAD or Import CAD command’s window. 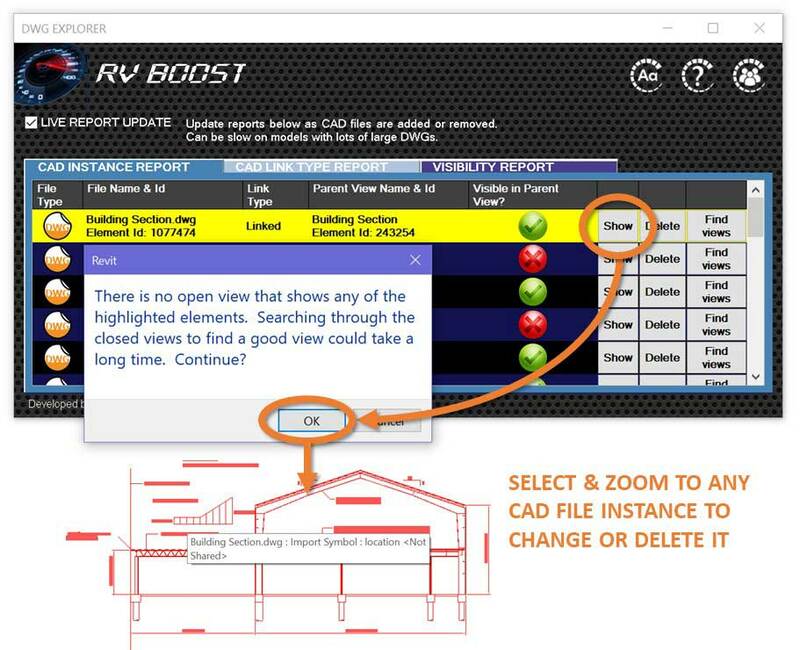 If you tick it, the CAD file will come into Revit as a view-specific element, which means it’ll only be visible in the active Revit view at the time of running the Link CAD or Import CAD command, I.e. the “Parent View”. Knowing this property of each CAD file is crucial for purging redundant DWGs from your model, because view-specific ones no longer visible in their parent views should be the first to go. Secondly, Manage Links doesn’t show whether each CAD file is still visible anywhere in the model. These files can very well be hidden by element, hidden by category, laying outside its parent view’s crop boundaries, or simply invisible due to other Revit settings. 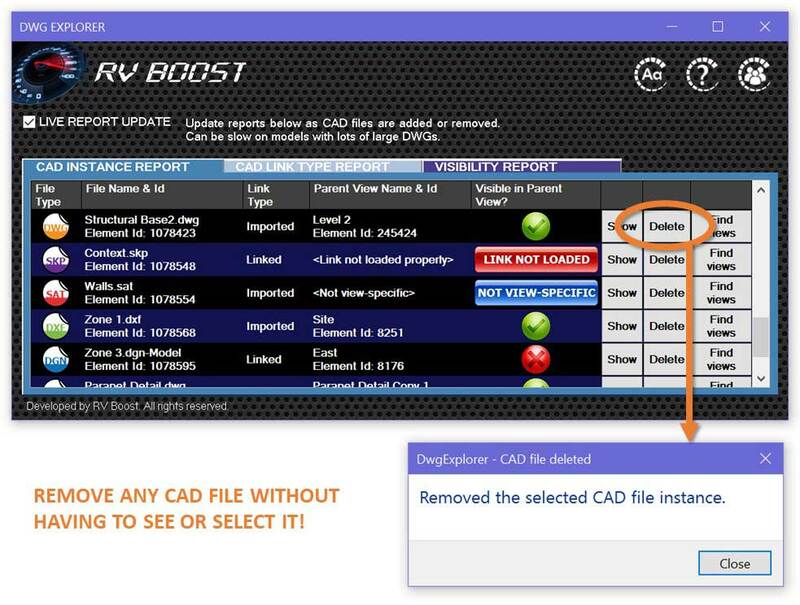 Without knowledge of CAD files’ current visibility, it’s very difficult to pinpoint which files is no longer visible anywhere to remove them. As a result, you may end up having under Imported Categories some redundant CAD file names seemingly impossible to delete! On top of that, it baffles most Revit users that Manage Links doesn’t look at imported CAD files at all. Some even consider this a big gap in Revit’s core functionalities. This is because many Revit models still have imported CAD elements either due to legacy project team’s decisions; the need to include DWGs in Revit model transfers; or other reasons outside of the project team’s control. Also, because they live directly in the model, imported CAD files tend to have a bigger impact on Revit performance then linked ones do. Hence, being oblivious to them can mean you’re leaving work every day later than you need to! Allow quick & direct removal of CAD files we know for sure are redundant without us having to open a view, which by itself can take a while in large Revit models, to select them first. 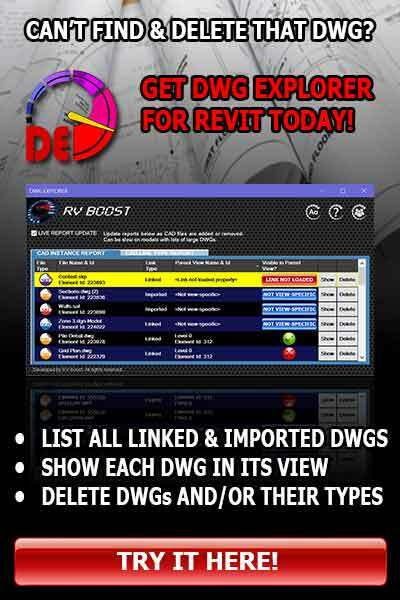 So far, the best add-in we have had which ticks all these boxes is DWG Explorer. Despite the name, it works with all CAD files in the model whether they are DWGs, DGNs, DXFs, SATs, SKPs and so forth. Each detected file will show clearly if it’s view-specific, whether it’s linked or imported, its file type, what its parent view is, and if it’s visible in that parent view. If you want to see a CAD file in a good Revit view or delete it, simply click on the Show or Delete button on its line. This also comes in handy if you just want to locate a particular imported DWG in your hundreds of views & sheets! 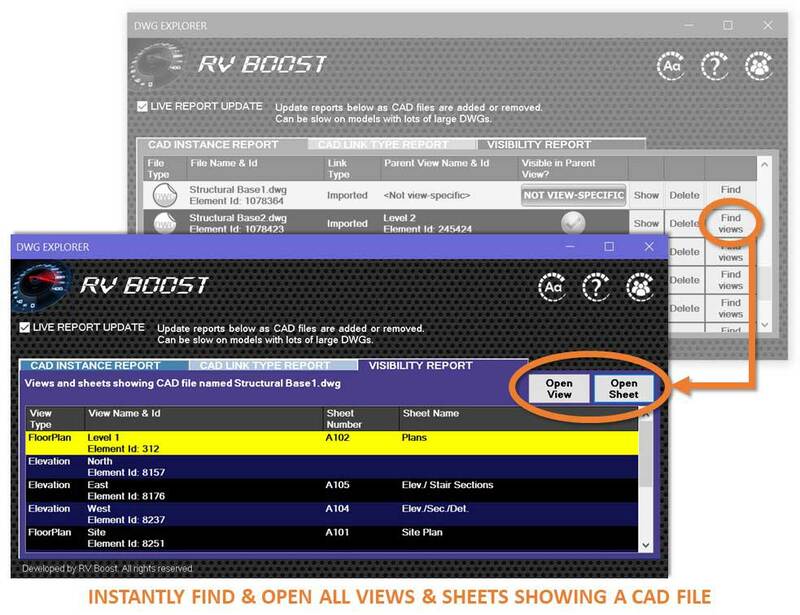 Another nice feature is the chance to select one CAD file from the list and click Find Views and see all views & sheets where that file is visible. Of course, this may take some time in large models with lots of views, yet still much quicker than checking all views manually yourself! You can then tell DWG Explorer to immediately open one of these views & sheets and zoom right into where the CAD file is. In addition, DWG Explorer also allows direct access element types of all CAD files in the model. For example, even if you have multiple copies of the same DWG in Revit, Revit will still use only 1 single element type to define each of these copies, similar to how a Revit family drives all its instances. 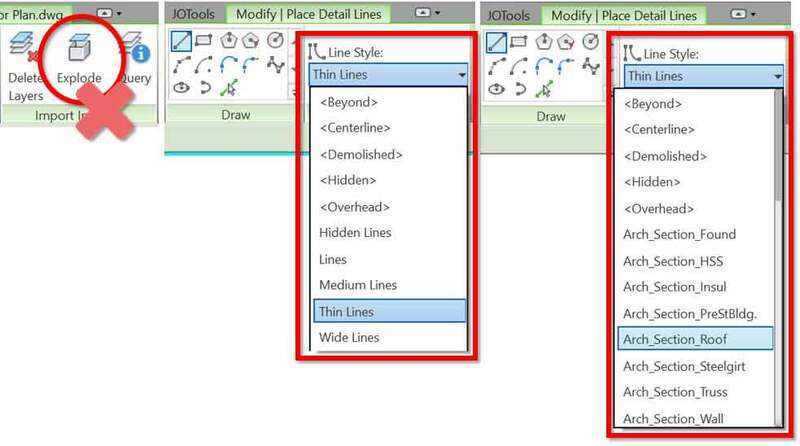 By letting us view & delete CAD files’ element types, DWG Explorer greatly helps see how many copies there are of each type and delete all of these in 1 click if necessary. This is particularly efficient if you’re trying to remove redundant CAD file names under VG > Imported Categories. 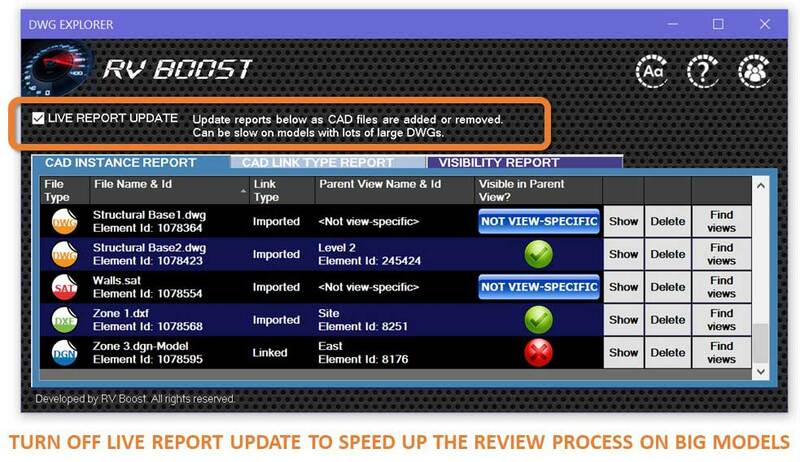 Instead of hunting down to delete all instances of the CAD file in hope that will take this name away from VG, simply remove its type directly from DWG Explorer’s CAD Link Type Report. As a bonus, DWG Explorer also has a toggle for “Live report update” mode. Keep this on and the reports will update as soon as we add or remove CAD files to or from the model. This requires re-scanning your model however, which can be a slight disruption when done in a large Revit file with many CAD files and hundreds of views. In that case, simply untick this box to only update the report manually by closing & reopening DWG Explorer from Revit’s Add-Ins tab. The app works solidly in all of our tests and provides unprecedented joy in managing CAD files visually & quantitatively in Revit. Finally, it also provides full explanation of key CAD files’ properties which may not be readily comprehensible to new or less experienced Revit users in your team. Helping them understand these properties is really essential to forming their good habit the next time they link or import anything non-Revit! For the most part, CAD files are indeed toxic to Revit. However, many of us still depend on them once in a while to combine Revit’s amazing BIM capabilities with databases it not yet possess. Hence, each project team needs a robust procedure for managing these CAD files to maintain the fine line between using them carelessly & consciously. This procedure will need to include the 3 rules of using CAD files in Revit as well as housekeeping intervals using either Manage Links or add-in such as DWG Explorer. Doing all this right and we can confidently tame these CAD files right in our Revit powerhouse.